Why Is There a Need for Automatic Litter Boxes? What Kind of Self-Cleaning Litter Box Is Right For You? Who Are Self-Cleaning Cat Litter Boxes Meant For? How Do You Make Your Cat Use It? 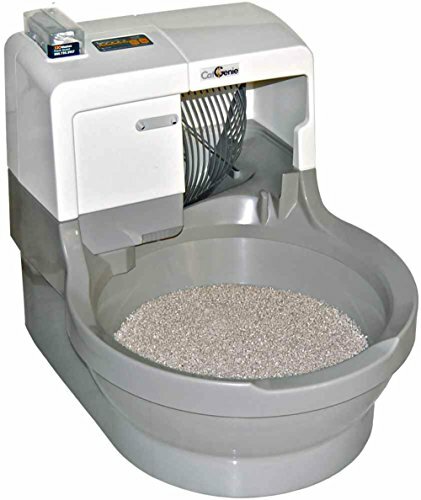 This is undoubtedly one of the best automatic litter boxes you can find. It does almost everything for you, and it’s almost like a scaled-down version of a regular toilet bowl, just made for a cat. Despite how complex it might look it’s relatively easy to set up and maintain on a regular basis. The instructions even tell you the best way to transition your cat to use it. With it in the house, no one will even notice you have cats since it eliminates the smell and leaves no waste behind. It will last for a long time as well. You might have trouble fitting it in if you live in a smaller place and it can be quite noisy, but other than that there are no significant downsides to it. This is an easy to use litter box that will get rid of all the smells associated with litter boxes more effectively than any other. In addition to that, it’s also easy to set up, and the maintenance is a breeze. Once it’s set up, you can just leave it for weeks on end and just remove the tray once it fills up, then replace it and you’re good to go again. You will also need to refill the litter from time to time. It does have to use special kitty litter, but it is good, and there’s almost no spillage whatsoever. However, there might be some leaks later on since the outer box is not durable. Your kitties also might end up scratching the bottom of the box, since it’s a bit shallow. 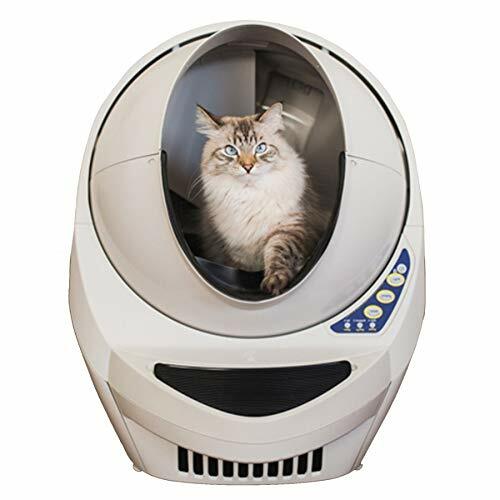 If you have a whole heard of cats, the litter robot will definitely make your life that much easier. It’s huge, and it cleans itself without you having to do much of anything. That is, once you have it set up, which can take a while. The size can be an issue if you live in a small place, but it’s also the greatest asset of this device since multiple kitties can use it without a problem. It’s also incredibly sturdy so it can withstand their scratching. Using it is easy, and it comes with a companion app that allows you to control it and monitor the way it’s working. One of the best things about this litter box is that you can use ANY litter with it, which also cuts down on the cost of the whole thing. Plenty of products require expensive, specialized litter but not this one. Setting it up shouldn’t be a problem, and it is fairly easy to operate, though you do need to replace the trays more often than with most other models. Sadly, if your cat is a scaredy-cat, it will hate this litter box due to its loudness – consider purchasing one of the other products in that case. 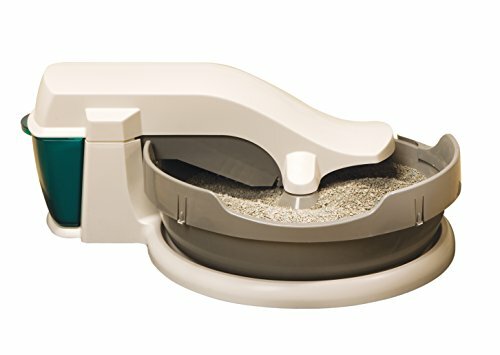 When you’re on a budget but still need a litter box that cleans itself, you probably ought to get this one. It comes at a price much lower than most competitors, and it still delivers on the quality. Another thing that reduces the cost of the whole thing is that you don’t have to put a lot of litter in it for it to work properly. Unlike most other automatic litter boxes, this one is quite as well, so it won’t scare your cat. The main downside is that there’s not a lot of space in the box due to the design. For most cats, this will be fine, but if you have a fat cat, this is not the right product to get. These days, we seemingly have too many choices to choose from, and many products are just over the top, impractical and useless in reality. However, you shouldn’t be scared away from all innovation, as many novelty items on the market are superbly useful. I would definitely say that automatic litter boxes are incredibly helpful and immensely useful. I’m sure that practically anyone who’s tried one can confirm this. Still, there are certain groups of people who they might be especially useful to, and I am going to touch on that topic, as well as many others, so stay with me and go on reading! Since there are multiple kinds of automatic litter boxes to choose from, different types fit different cats. I am going to present you with things to look out for when buying a self-cleaning litter box for your cat so you can make an informed decision when buying one. Obviously, this is a big one. You need to consider your budget during every single purchase in order to shop responsibly, especially if it isn’t something that you buy every day for a dollar. And a litter box for your cat is not just a minor purchase of chewing gums, for example. Not that it’s always the single most important thing, but it is a rather bad habit to buy things without even taking their price into consideration – even for people who are well off! Buying the cheapest possible thing on offer without paying any attention to its quality is an extremely bad habit of people who think that this kind of shopping will save them money. As a matter of fact, everyone who practices this philosophy realizes sooner or later that things can get a bit tricky this way. Namely, you can end up spending more money on fixing a problem that a low-quality thing has caused than you originally would have spent if you had purchased a good quality product. So, try to buy a quality product instead of trying to save money. However, you should also make sure that you’re not getting ripped off and overpaying. Looking at user experiences with the product before buying it is a good way to gauge the quality-price ratio. Automatic litter boxes are made with the intent of making your life easier and saving you time. However, that intent doesn’t always come through in practice, and some of these devices can be much harder to use than a regular litter box. Setting up some of these devices, especially the more complex ones, can be a chore in itself, one that could take hours or days until you get it to work the way you want. On the other hand, the setup could be simple and easy to do – which is preferable. Even some complicated devices can be easily set up if they come with a good instruction manual. Cleaning and maintenance can also take up a lot of time. Again, more complex devices also tend to have more problems in this regard. 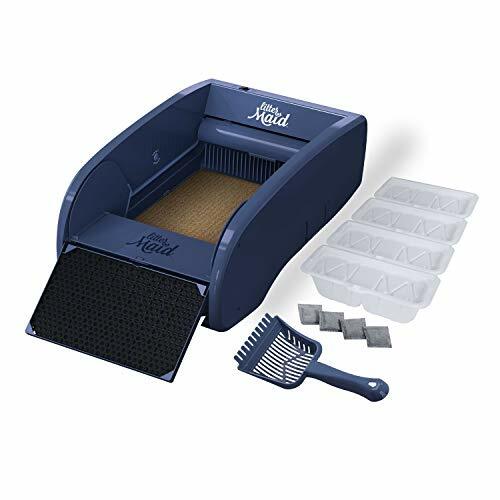 If something goes wrong in a litter box like this, the mess can be incredible, and you’ll be left without a place that your fuzzy baby can use to poop. Luckily, the better devices will be able to work maintenance-free, and the cleaning process will be almost completely eliminated. Check the experiences of other customers who bought the product to get a good idea of how easy it is to use. While the outside appearance of a litter box might not matter all that much to your furry friend (or friends), it will almost certainly matter to you. After all, you don’t want a shabby-looking litter box to mess up the overall look of a certain room. Luckily, litter boxes come in a wide variety of shapes and colors that you can choose from and the same goes even for self-cleaning litter boxes. Some of them can be extremely aesthetically pleasing. In recent times, ‘hidden’ litter boxes have also become popular, mostly as a novelty item. These litter boxes are made to blend in and don’t even look like litter boxes. They might look like a regular piece of furniture, a potted plant or something else, and it doesn’t impede their function. If looks don’t matter to you, you can pick whatever you like, but you’re still more likely to try and find something that at least fits the color scheme of the room you want to put it in. While we’re still on the topic of quality, a big part of that aspect is a product’s durability or staying power. You are going to want to buy a long-lasting litter box for your cat, and one that is easy to use, as well as hygienic. Cats can be quite rowdy, and you’ll be amazed at how easily they can tear apart a liter box that looks completely solid. I also want you to pay special attention to odor control mechanisms. A special tip that I’ve found to be very useful is to make sure that the tray of the litter box is leak-proof. This can prevent some major inconveniences! Here’s another heads up: Many self-cleaning litter boxes also have an automated sensor that is a huge help with litter management. Phew! Choosing the right litter box is in fact really dependable on your cat’s specific needs. As a cat lover, you probably already must know that every cat is unique. They each have different personalities, preferences, and characteristics. Because of this fact, you should probably try and adjust the products and supplies that you buy for your kitty to her personality and needs. Your cat’s size is certainly one of the more important things to take into account when making this purchase. This aspect can in a way be connected to her breed. We know that two cats of the same breed can be of completely different sizes. However, it is certain that there are some smaller and some larger breeds. So, these things are still something to keep in mind. Still, a cat’s breed can’t be a leading parameter in picking the best litter box for her. And I am completely aware of that. Even so, there are some things and traits that practically all members of the same cat breed share. I’ll name a few specific breeds with their specific characteristics, too. When you’re buying things for your cat, you most probably think that it isn’t relevant at all that she is of Persian breed, for example. Even though this is something that most people think, you still have to take into account that Persian cats have large, thick tails. Many breeds of cats practically always have this particular trait. For instance, Norwegian Forest cats are also gifted with beautiful, thick furry tails. But not all cats are. For example, the adorable Aegean cats have skinny tails. And the thickness and length of tails aren’t at all the only signs of diversity between the typical representatives of different breeds of cats. So, what do we do with these differences? Why do they matter when one is making cat supply purchases? Well, traits such as a large body part may disturb your cat’s process in the toilet. They may be in the way of her feeling comfortable while doing her thing. In this case, try to choose litter boxes that are appropriate for very fluffy cats, such as open ones with no hood above. A cat that is of a very large size is clearly going to have to get a big litter box. On the other hand, if you are the owner of a small adult cat, you can treat your kitty with a closed litter box. For those of you who are a bit less informed on this, the closed ones come with something like a roof, sometimes called a privacy hood. Should You Buy a Tiny Litter Box for a Newborn Kitten? There are two sides to every coin, and this is a somewhat of a debatable case. On the one hand, tiny kittens have a very hard time entering large litter boxes with high edges. On the other hand, buying a small litter box may not be ideal at all, either. Obviously, your tiny kitten is only going to be growing all the time, and you can’t buy an additional litter box every single week. What’s also important is to always remember that young and small kittens aren’t the same as adult cats who are just naturally short. The young, new-born kittens won’t be small forever! It’s surprising how incredibly fast little kitties grow. Seriously, people say that kids grow up fast, but the growing process is incomparably more rapid in cats. I definitely can’t make this decision for you, but I’d strongly advise you to help the kitten out while doing her stuff at the very beginning. Take some time to help the baby out as she’ll be able to use the big cat litter box sooner than you’d expect. This way you don’t have to spend extra money on kitten litter boxes, plus you’ll be making a bond with the young kitten, which is important and always awesome. Anyone who’s dealt with cats knows how full of personality these cute beings are. Unlike dogs, they won’t just comply with all of their human’s rules, at least not without a fight. This is especially true if they don’t like the rules – but in all honesty, sometimes they don’t want to listen just because they’re so stubborn. Being the cat lover that you must be, you are probably going to do anything just to please your beloved kitty in order to make her happy and cuddly. Admit it – you’d do anything to hear that “purr” sound come out of her! This also means you need to have her personality in mind when you buy her things that she needs. That’s right; no size fits every cat! This is why there are different options of self-cleaning litter box products that cater to different personalities of cats, among other things. I’m going to list a few possibilities for you all to consider. Let’s see what they are very soon! There are some cats who love running around all the time. I suppose it would be right to recommend an opened litter box that’s a bit bigger. Perhaps a cat that is extremely active and can’t stop running all over the place would hold it in until she REALLY had to go if she had an enclosed litter box that is in a place in the house that’s hard to reach. Have you ever notices how much cats enjoy being in tiny, comfy places? Don’t you ask yourself why this is? A lot of us just can’t deal with the fact that, even though we offer and buy cool stuff to our cats, such as kitty beds, they still don’t like them as much as crawling in boxes? Sometimes it’s hard not to be a bit offended by your cat, for example when you buy her something really nice and she only ignores it, and instead just slips in the bag it came in. Or when you allow her to get on any of the couches or chairs, and she still chooses to sleep in a shelf? Well, whether it is a shelf, a drawer or a box (boxes are their #1 favorite thing ever), it’s a simple fact that cats just really like being in enclosed places by nature. I don’t know a single cat that doesn’t anyway. The reason why this is has yet to be proven by science. My personal take on it is that it makes them feel safe and protected. Maybe it’s a thing dating back from their wild past, but the love of being in the comfort of a tiny, enclosed space that’s just enough for them to fit is there and isn’t going away. Enough with trying to figure out cats’ reasoning (we will never figure it out, ever), let’s get back to our original topic. What I really want to say is that if your cat is an avid lover of tiny places, and if she literally grabs any opportunity to get in anything small, enclosed self-cleaning litter boxes will be perfect for her. Read further to find some more word on this kind of automatic litter box. Just like the case is with regular litter boxes, self-cleaning ones an also come in the enclosed form. There are two main reasons why I think these are great, so hear me out on it. Haven’t you noticed how much cats like boxes? Yours probably does, too. Well, closed litter boxes can actually be a great source of enjoyment for kitties who like closed-up, comfy and tiny places. And I know that a lot of cats do for a fact! Try to pay attention to your cat’s preferences to see whether she’d like a closed-up litter box. Another great advantage of enclosed kitty toilets is that they do a good job at isolating the smell from the outside! Obviously they can’t block the smell completely, but they don’t do too bad of a job in this field, either. They also look prettier and offer more privacy for the cat – its business won’t be open for the whole world to see! Let’s face it; in this day and age, everyone could use a bit of extra time. I know that there are pet owners of all profiles reading my blog. Still, I can bet that most of you, if not all, find yourself in a situation where you some need extra time for a task, assignment or chore from time to time. There are certain professions that are traditionally known to be very demanding and to take a lot of time out of a person’s life, such as those of medical workers or business people. However, in recent years we’ve seen people working harder and harder and being busier with their careers than ever, regardless of their occupation. Even is this busy world, there’s clearly still a big place in people’s hearts for cats. There are more than 88 million pet house cats in the US alone; much more than there are pet dogs. Now, that’s a huge number of cats in ownership. Therefore, we can all be pretty sure that most people who have a cat or more don’t have all the time in the world. Most cat owners can’t cater to their kitties constantly, which is completely understandable. If you are one of the many people that have a cat in the house as well as a work schedule that is just a full plate, then getting a self-cleaning litter box will be life-changing. Forget about having to clean your kitty’s litter way too often! This so-called litter robot will take this chore away from you with ease. Now you won’t have to constantly worry about whether your cat has clean litter anymore. Sure, your kitty is adorable and is always being charming and doing cute things. This still doesn’t mean that you have to be as snug as a bug in a rug while cleaning her feces. There are many cat owners who simply find cleaning their cat’s litter box too unpleasant. This is completely fine, and you can rest assured this doesn’t undermine anyone’s love toward their kitty in any way. Luckily for all people who dislike doing this, self-cleaning litter boxes exist. And what’s more, some of them are so advanced that they can even be connected to your home’s pipes! This way, you literally never have to worry about scooping again. Sure, your kitty is adorable and is always being charming and doing cute things. This still doesn’t mean that you have to be as snug as a bug in a rug while cleaning her feces. Luckily for all people who dislike doing this, self-cleaning litter boxes exist. And what’s more, some of them are so advanced that they can even be connected to your home’s pipes! This way, you literally never have to worry about scooping again. Some cat owners will either let their little one do her thing in the backyard or in a specific place in the house dedicated to that. However, what are the people who don’t have a large house with a yard supposed to do? Letting your cat defecate somewhere in your apartment can often be REALLY unpleasant. Even if you get used to the smell, what are you going to do if you want to bring in a guest who doesn’t have cats? These situations can sometimes be pretty uncomfortable, and even embarrassing. Luckily, you don’t have to expose yourself to them. Now, your cat really doesn’t care where she will go to the loo. However, as a human, you can’t be as laid back towards that as she is. She can’t know that the things she sometimes puts her little snout in just to check actually smell horrible to us. For said reasons, self-cleaning litter boxes are ideal for people who live in small places. The smell they radiate is less intense to a considerable degree when compared to regular litter boxes. Definitely recommended! While your little fuzzy baby might have been number one in your life before, now that you have a human baby to look after, that might not be the case. Taking care of a newborn baby or a young child is hard work, involving plenty of sleepless nights and a lot of running around. This might not leave you with enough time for your pet, or at least not as much as you had before your little bundle of joy entered your life. Automatic litter boxes are a godsend in that case. Every bit of time counts when you’re busy taking care of a young baby and keeping your life together, so saving a bit of time on cleaning your kitty’s litter can mean a lot to you. Going to the bathroom is can be delicate for all species, so make sure you have the right location for your cat to be as much comfortable as possible. Make sure it’s easily accessible, and it’s not surrounded by things that can be a distraction. She should be able to get to it easily. Make sure the litter box is easily accessible. It should not be surrounded by anything that can be a distraction to the animal. She needs to feel safe while doing this, especially if it’s defecation we’re talking about. I’ll elaborate in a bit more detail. Even if you have never in your life had a dog, you certainly have seen one of them poop next to the street at least a couple of times in your life. But have you noticed how they always (provided it’s not a stray, but a pet dog) stare at their owner in the eyes while doing this? Cats do the same thing when they’re with their human. This is a rather strange habit that our pets have, so why is it that they do that? That’s because pooping is a time at which they feel vulnerable, and they’re looking at you for emotional support. If they see you’re distressed, for example, they’ll take that as a sign that danger is close and finish their business in no time. It’s a simple but effective survival strategy – when they can’t have a complete view of the situation and feel vulnerable, they look at others for support and cues of danger. In this case, that means you, their owner, the creature they trust the most. Because of that, it’s important for them to be able to their business in a place where they feel like they’re completely safe from outside threats. A secluded place that’s not too far away from you is probably an ideal place for your cat’s litter box. Make sure it’s not too secluded though, so your cat can easily remember where it is and feel like it’s got you watching its back. Other things can also pose problems, like sound sources or obstacles. Cats like to go on their business privately and quietly. Also, make sure it’s far enough from the food bowl and water bowl. If you set the litter box close to the cat’s food or water, it won’t even use it. They like to keep things clean, which is one of the reasons why I love them so much. Well, you will have to train the cat to know where to go to deface from now on. If you already had a place for a simple litter box, just swap it with the automatic one, and that’s it. Sure, your kitty might take some time to adjust, but it will know what it’s for. If things don’t go so smoothly for you and your pet, then the training sessions should start. Pay attention when does your cat want to go to the bathroom. Some cats do it right after they ate, some after they sleep and others after they had a good run around the house. Introduce the new litter box to the cat once you notice it should use one. Make the cat get accustomed to it each time; you will have to be there for it for few couples of times. If the cat has a hard time getting into the crate, which should be a very rare case, you can pick the cat up and bring it into the crate. She will know what to do next. A couple of times of this kind of potty training and your cat will get used to the new litter box. In case the cat doesn’t know what to do, which might be the case with small kittens, you can show it what to do. Don’t use its paws though – that might scare it off. Dig through the litter a little bit with your fingers, and your feline friend will get the idea. You may also need to show your cat how to bury its excrement – no problem, just do it yourself. Pick up a bit of litter and throw it onto the poop. After a few repeats, your little fuzzy baby will understand what to do. Don’t be harsh and don’t yell at the cat if it takes a longer time to start using it then you expected. Not all cats can get used to new litter boxes that quick, let it go at its own pace and have a bit patience until it learns how to use it. If you want to discipline a cat you need love and Well, you will have to train the cat to know where to go to deface from now on. If you already had a place for a simple litter box, just swap it with the automatic one, and that’s it. Sure, your kitty might take some time to adjust, but it will know what it’s for. To wrap everything up, I hope I helped all of you to upgrade your cat’s litter box. I know you want the best for your cat, and getting some inside info can help a lot, I know this, so I tried my best to give you everything you need. 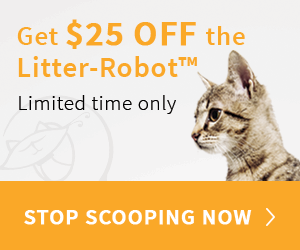 When I tested all of these, I liked the Litter-Robot III (Click to get $25 off) and the CatGenie the most, and I couldn’t decide which one is better. 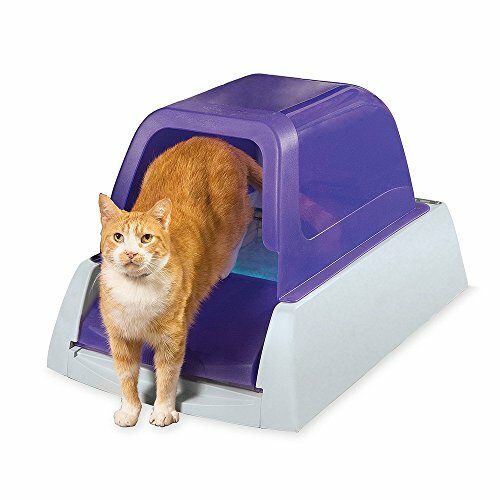 But I like to treat my cat like myself, so the CatGenie was an excellent choice mainly because it works like a regular toilet for humans, and it looks like one too. So, for me, that would be the best automatic litter box I could find. Looking for flea treatment options for your cat? Read this post on the best flea treatment for cats.